Do You Have Pyramid Fever? 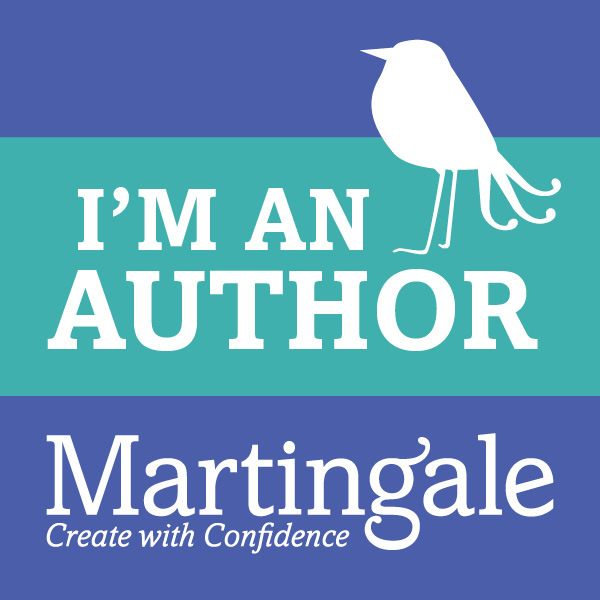 In my last blog post, I promised I would share two projects that I'm really jazzed about and have captured my attention. I didn't have time to get all of the things together for both projects, so rather than wait, I'll just tell you about one for now, and get to the other one soon. Have you heard about the Panama Pyramids craze? 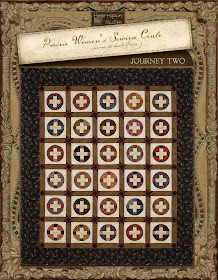 If you haven't, you need to know about this sweet quilt. 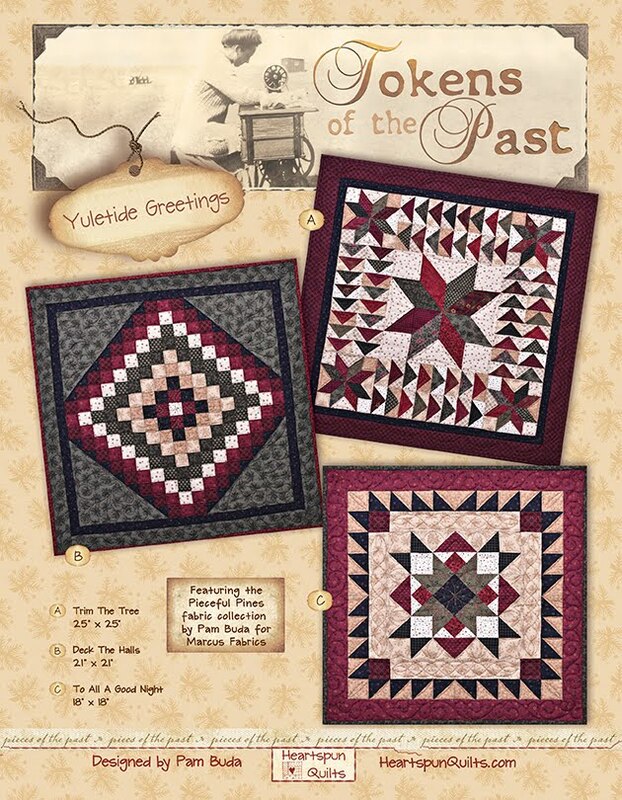 Linda Collins found this antique pyramid quilt and fell in love. 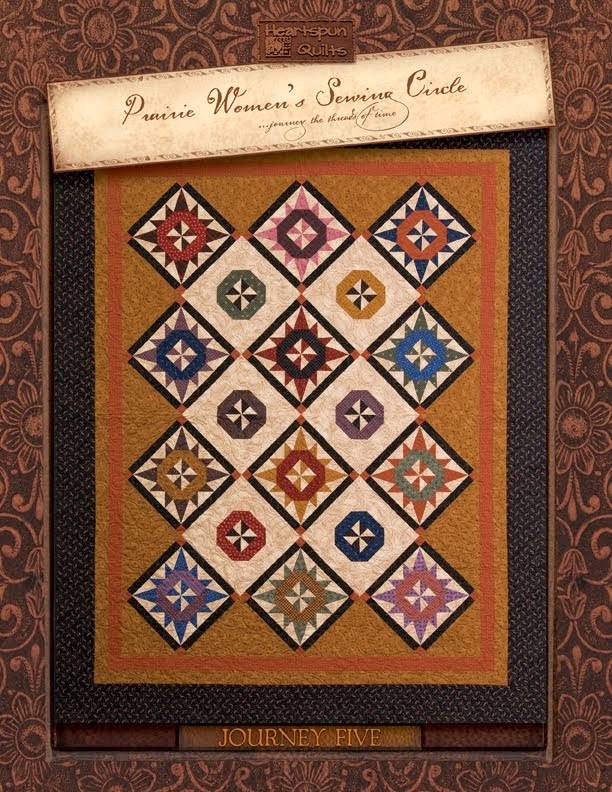 She published the pattern in the March/April 2013 issue of Quiltmania magazine (seen above.) Since then, a true phenomenon has occurred with quilters around the globe taking part in what has turned into a Panama Pyramid frenzie! Count me in as one of the frenzied. 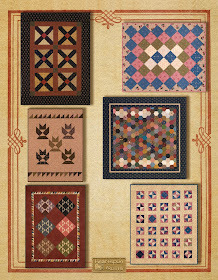 Linda made it super easy for all of us to make a pyramid quilt of our own when she created a set of awesome templates. No need to worry about how to match triangles as the notched points make everything....and I do mean everything line up to perfection. Honestly, this block is as easy as a Nine Patch....promise! I trace and cut my pieces while I'm watching TV. 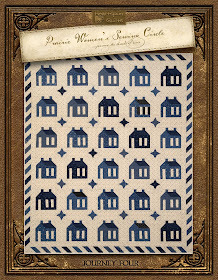 These blocks are so fun to mix and match fabrics. I'm only using my scrap stash for the pieced blocks. I haven't yet decided on what fabric color to use for the alternate triangles that will set the quilt. I have lots of time to decide. It took me less than 10 minutes to machine piece my block. Super easy. 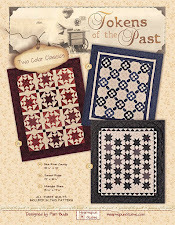 With Linda's templates you can also hand piece the block as well. 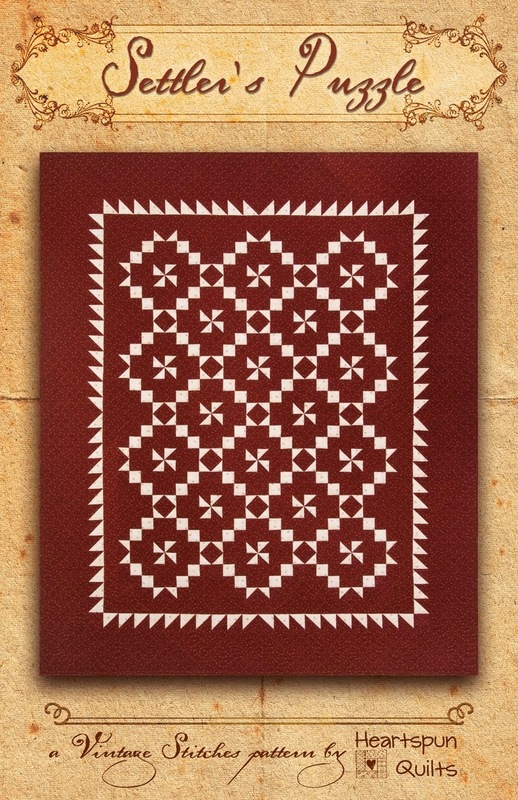 I've long admired pieced triangle blocks and viewed them as very difficult to make. Perhaps they would be more of a challenge without the template, but this could not be easier. 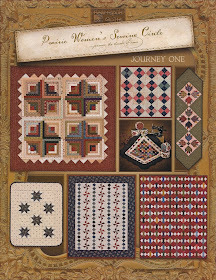 I did not anticipate how fun they are, which apparently is something I share with hundreds of quilters around the world. Yes....truly around the world. I know this because I'm part of the Panama Pyramid Facebook group! Linda Collins hosts this group of about 600 quilters (and growing!) and we recently posted where we live. I think we have folks from five continents! This group posts a plethora of pictures that give endless ideas and inspiration. You can ask questions if you'd like, and look for advice about cutting and pressing...all kind of things. It's total eye candy and such fun. If you'd like to join the Panama Pyramid group, in Facebook, search for Panama Pyramid Sew-along 2016. This is a closed group...just look for the place to join within the header on the page. Linda will get back with you as soon as she can. It's that easy. 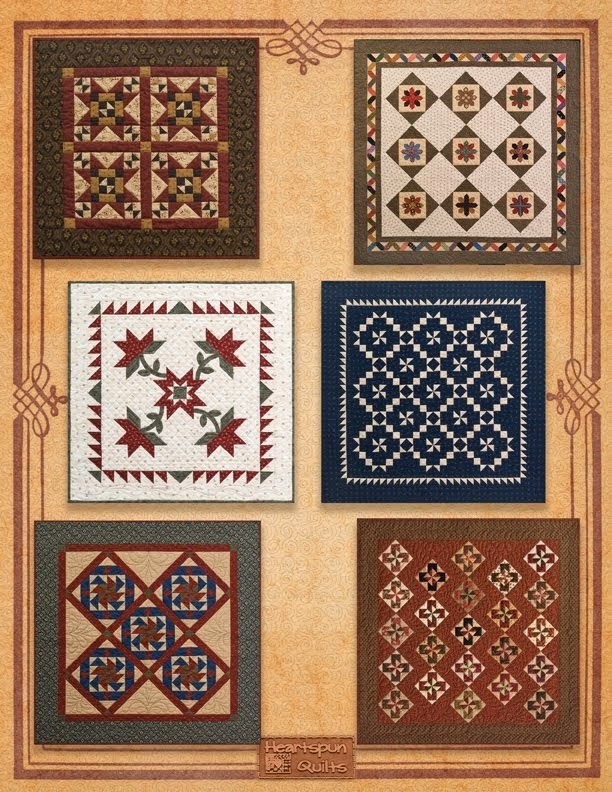 If you'd like to order a copy of the magazine and/or a set of Linda's Pyramid Templates, you can call the Homestead Hearth Quilt Shop at (573) 581-1966. 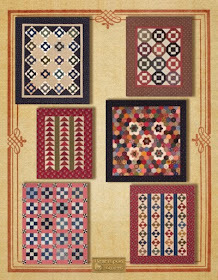 You can also buy the Pyramid Template set from The Quilt Merchant by calling (630) 480-3000. Jump in ~ it's so fun!!! During evening television and over the weekend, I found scraps of time to work on some personal projects and was able to finish a few things! Yes...I said finish! I have been wanting to make this for soooo long, and now, FINALLY....she's done! Just in time for the July 4th holiday. I'm so jazzed....doing the dance of JOY! 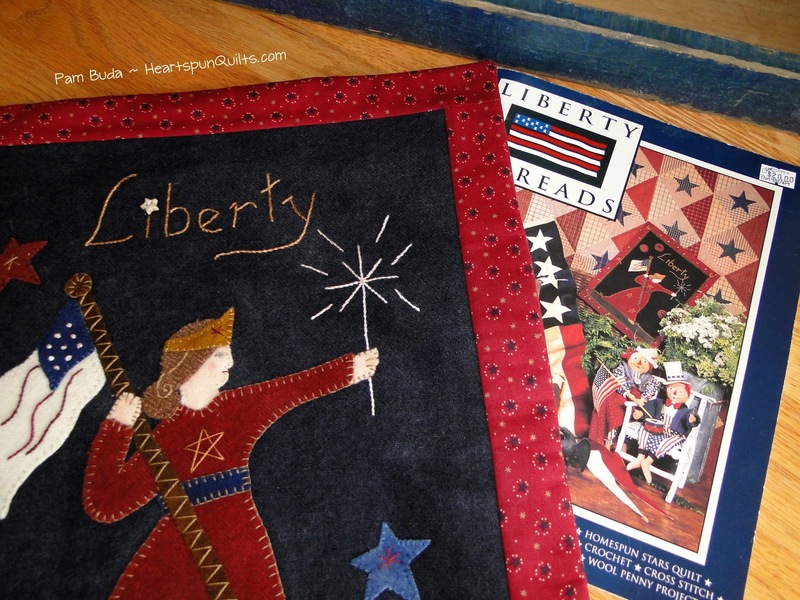 I'm not sure why I am so drawn to Lady Liberty designs, but I am. Maybe it's her strong, defiant stance? I think she's so cool. Love the details in this piece. Her face is so simple, yet really suits her, don't you think? I didn't have to look far to find just the right fabric to frame the wool center. The flash on my camera makes the red border from my new Star Spangled Liberty collection seem a lot brighter red than it really is. (Don't blame the camera...the problem is with the person pressing the button.) I substituted stars for wool pennies in the background. Seemed appropriate, and I'm all for changing things to make them your own. My goal is to have different wool quilts I can swap out during the year to have something wool wonderful to enjoy while I'm doing the dishes. 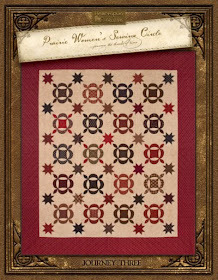 Presently, I have this Kim Diehl quilt to enjoy. Here she is in her place of honor. Big honor.....center stage over the kitchen sink! Teehee. Well, she really will be enjoyed all day as we all pass through the kitchen, or are in the kitchen. 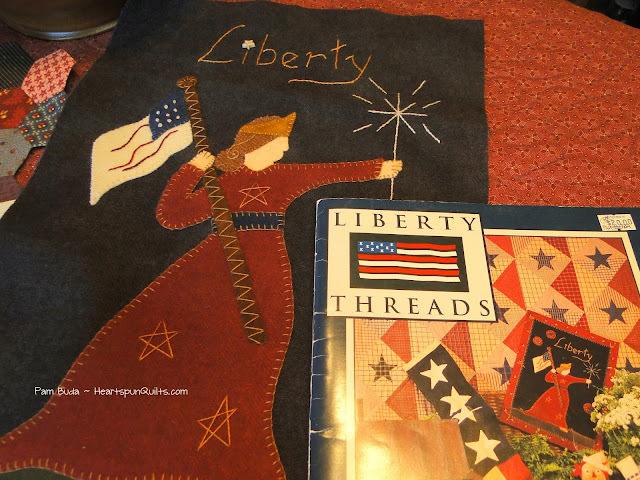 How have you been doing with finding time for a little sewing each day? I'm not doing badly at all. Finding more time than I thought I would now that I've set my mind to it. 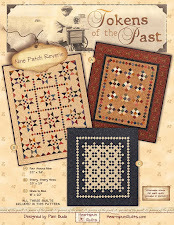 Oh, and I completely lost my mind and signed up for not one, but TWO new scrappy projects that I just could not resist. I blame it all on my obsession/addiction, love of fabric, and apparently no will power. I'll show you the projects I couldn't resist in my next post. Try not to judge me too harshly...you might find yourself joining the fun!! Next month, I'll be giving a lecture & workshop near my home, and one out of town in Maine!! 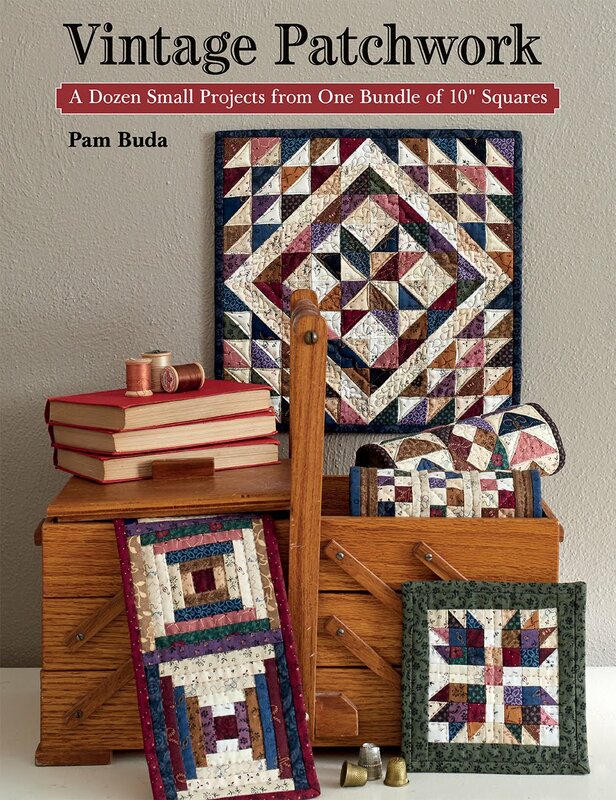 July 21st, I'll be visiting with the Pride of the Prairie Quilters Guild in Plainfield, IL, giving a lecture at 7pm that evening at the Zion Lutheran Church at 11007 Book Rd., Naperville, IL. 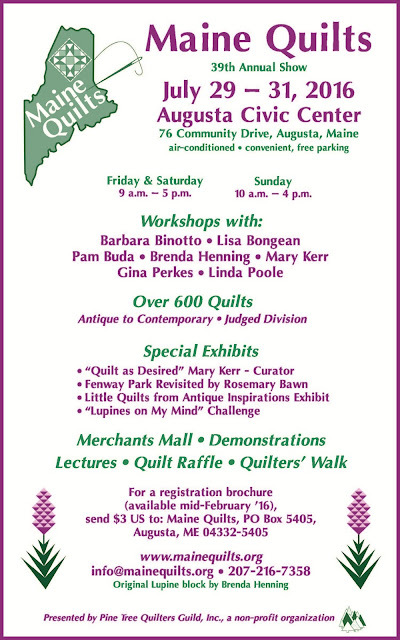 The following week, my hubby and I are traveling to Augusta, Maine for three days of great fun at the 39th Annual Maine Quilt Show. I will be giving a lecture Friday afternoon, and four workshops over three days. One of my classes is full and the others only have a few spaces left. 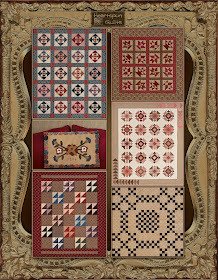 Click here to find out more about the Maine Quilt Show. After the show, we're taking a few vacation days to drive to Vermont, a state we've never visited before. If you know of some fun things to do while visiting Vermont, please let me know. Nothing like getting advice from someone who's been there, or lives there. No matter how long you've been quilting, it's good to get out of the sewing room once in awhile to take a class, and visit a guild show. 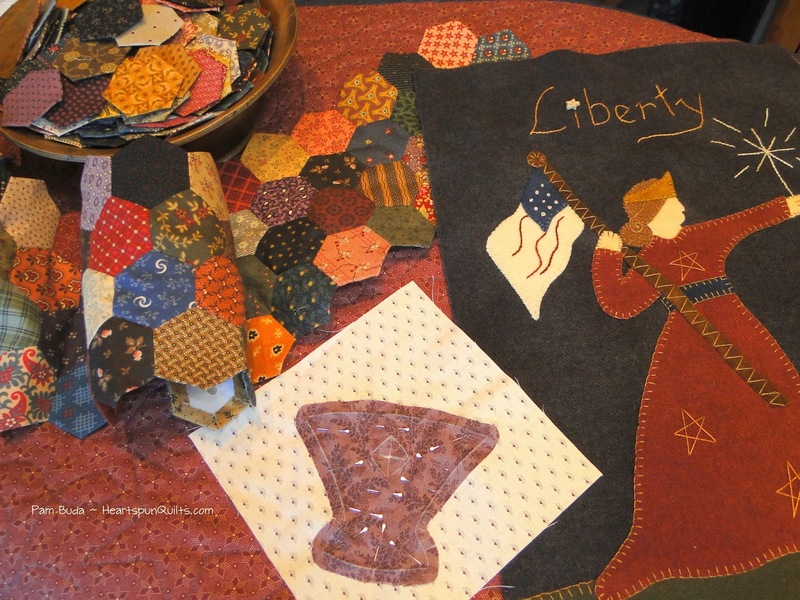 So much to see and learn, and quilt guilds are terrific organizations to support. I can't wait to see what's in store for me while visiting both of these guilds. I hope you'll think about attending, too!! Checking in with you....being accountable about finding scraps of time here and there to work on projects that are not work related. I've done fairly well this week....how about you? This morning, I prepped the bottom of this little basket block to applique later this evening. In addition to making a few more Nine Patches, I added lots more hexies to my hexie quilt....a long term work in progress. 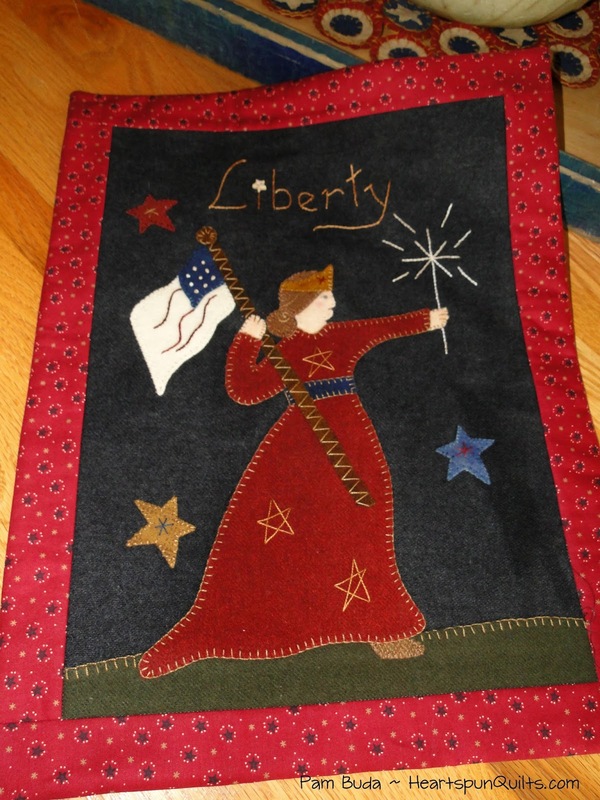 And....I'm almost done with Lady Liberty, a wool project I've been pining over for years. 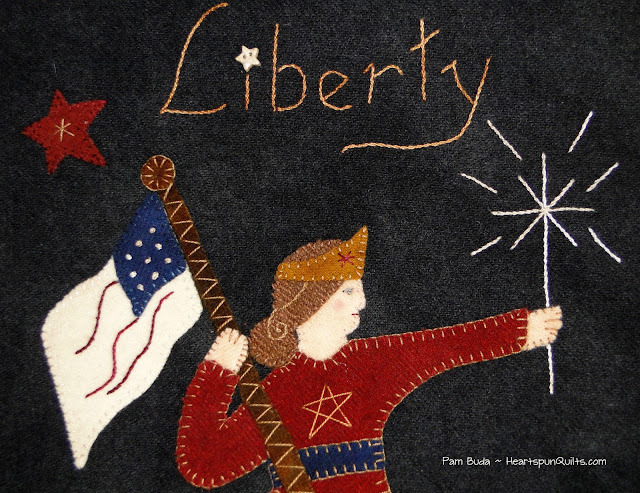 All I have left to stitch are a couple of stars and the details of her face. Despite having most of the DMC floss colors, and a mountain of Weeks and Sampler over dyed threads, I don't have just the right color to match her head. I'm stuck until I can go shopping at my local cross stitch store. Gggrrrrr....so close! 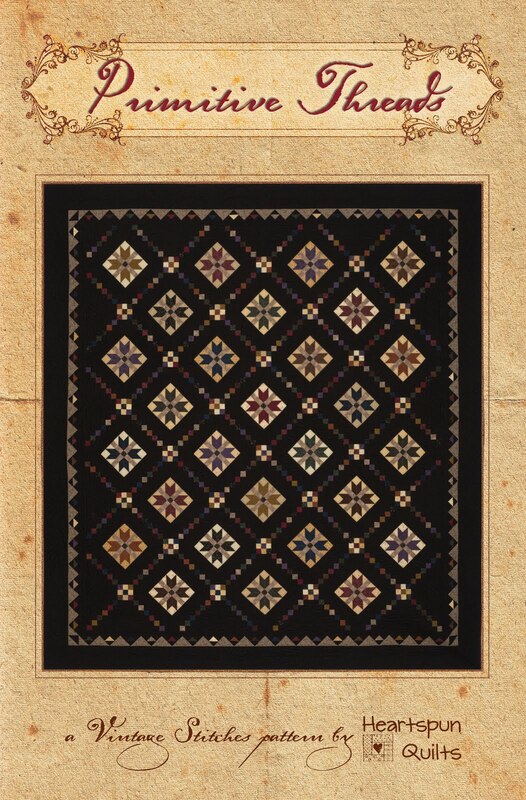 During work hours, we're finishing the assembly of my next BOM quilt (announcement to come in July), and completion of writing the pattern for Tokens of the Past: Union Forever! Lots to keep me occupied. June, in the midwest where I live (suburban Chicago area) is a wonderful time to be outdoors. Humidity has not yet come to stay, and no mosquitos. Perfect stitching in the evening with a glass of wine! 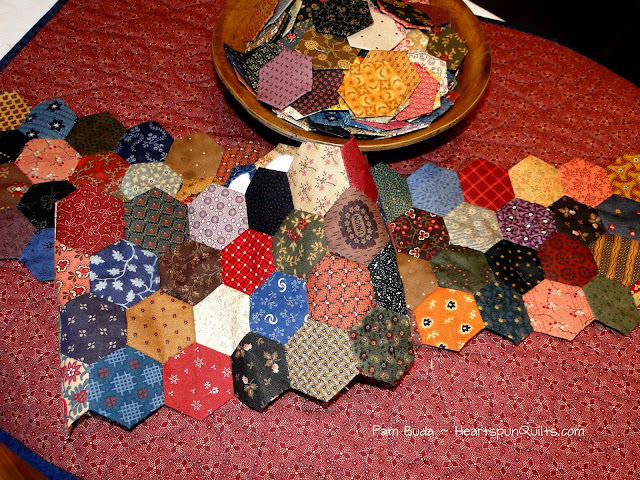 Post your stitching to #ScrapsOfTimeScrapsOfFabric on social media so we can all see what you're working on. If you don't know how this works, you can Google the above hashtag and click on the Images tab at the top of the page. Or, you can enter the hashtag in the search bar on Facebook and the entries will pop up for you. Have a stitch happy week! 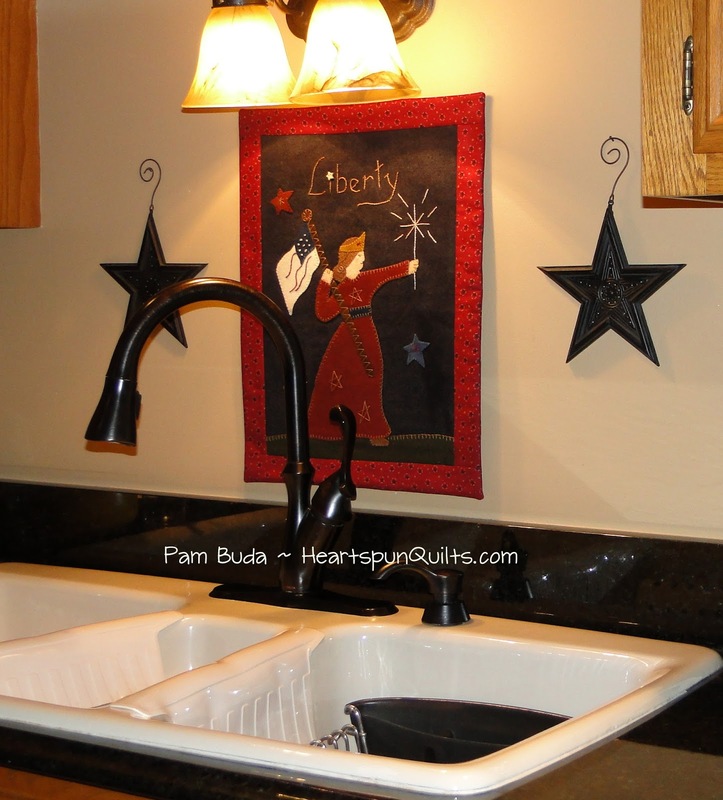 The Quest: Find at least 15 minutes each and every day to sew. Sew something or prepare to sew blocks! Make progress everyday! No matter what. The Usual Outcome: Good intentions that usually don't result in patchwork derailed by a thousand other tasks more pressing. Sigh.....no pun intended. I mentioned in my last post that I'm already working on my next BOM program with Marcus. At the moment, I'm fortunate to be working with brand new fabrics, a new design, and I'm sewing! Wonderful. Most of the time, my day isn't like this. No complaints....honestly! Well, kinda. I never forget how blessed I am to have this job, so I'm not complaining about that....but, as a quilter, I long to piece patchwork everyday. Get my fix....feed my soul. You know! You get it. But like most of you, our busy schedules don't always allow for that precious time spent with fabric, needles and sewing machine. As I was sewing yesterday where I do my best thinking, I'm feeling pretty good and loving it. I have a bag of 1" scraps pinned to a bulletin board just behind my sewing machine, and another with tiny Nine Patch blocks I make with those 1" scraps. The scrap bag is bulging. The Nine Patch bag is pretty empty. I L*O*V*E tiny Nine Patch blocks. I want to make them by the thousands. I have about twenty....because....no time. As I'm sewing and thinking, and say to myself...oh come on....can't you find 15 minutes each day to prepare the blocks and sew them? A little time? There's got to be 15 minutes somewhere that you can do this! YES....I know there is, and you know what will make me find the time? Being accountable. When you sew with friends, you're more accountable to keeping up so as not to disappoint them, right? Works for me, anyway...and it's a whole lot more fun. 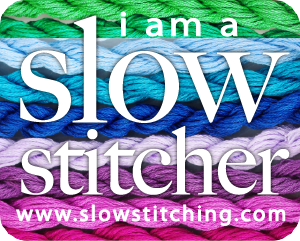 So....as I'm sewing and sewing, I'm thinking and thinking, why not ask you all to join me? 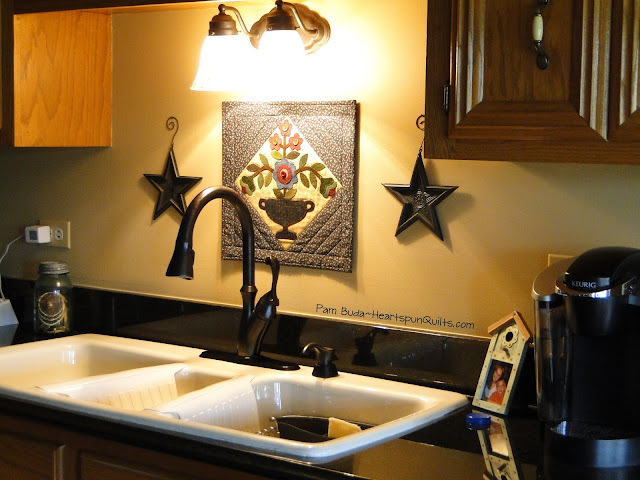 We can find Scraps of Time to sew Scraps of Fabric a little everyday. What do you think? Are you game? Here's what I propose.....we make a commitment to each other....nothing official, no blood drawn and smeared with an official oath or anything, just a cyber pinky swear that we're in it together. We all sew what we want a little everyday. I'm not asking you to make a thousand 1.5 inch Nine Patch blocks with me...no, no. Prep and sew whatever fills your heart. You can be accountable to me, and I will be to you. Once a week, I'll show you my progress and report how I'm doing. I'll post on Instagram and Facebook as well....if there's something fun to show you. I won't bore you with how many scraps I cut today, but updates here and there, which are necessary for the accountability part of my commitment. If you're feeling like this is resonating in your heart and want to join the fun, post photos of your accomplishments to #ScrapsofTimeScrapsofFabric where we can all see what we're sewing. Here's what I accomplished yesterday. Probably not thrilling for you, but I'm very happy! Today I'll just prep more Nine Patches to sew the next day. I sure hope this works! And I'd love to hear from you. How do you squeeze a little time to sew everyday? Maybe you're like me and want to make the time...I'd love to hear from you as well. I feed my soul with the stitches I sew......truer words were never spoken!